Generally known by its culinary names, viz. ris and gullet sweetbread, thymus plays a significant role in the functioning of immune system of your body. Located behind the sternum (or breastbone, as you call it) and in front of heart, it is responsible for the development and training of T-cells (or T-Lymphocytes) that are the structures of vital importance in your body because of their critical role in the acquired or specific immune system. Structurally, it is composed of two lobes (left and right) that are identical to each other and are present between the left and the right lungs. This glandular structure is vulnerable to a number of mild and fatal diseases, viz. autoimmune disease, hypersensitivity disorder, cancer, and immunodeficiency syndromes. 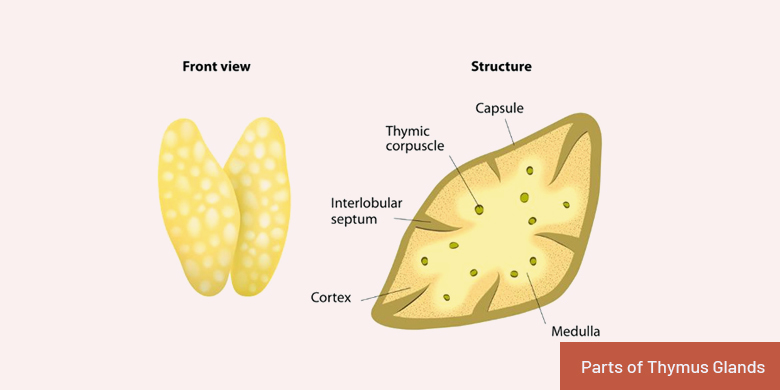 If you look at the anatomical structure of the two identical lobes of the thymus glands, you can easily make distinction between the central and peripheral regions which are called medulla and cortex, respectively. However, the third major component is the protective layer that surrounds the peripheral cortex, called outer capsule. The two structurally and functionally different types of cells, present in the organ, are assigned different tasks for the development of T-lymphocytes, and are named as hematopoietic and the stromal cells. The T-cells, produced therein, are supplied with a specific region that enables them attack on the harmful foreign substances, called receptor cite. 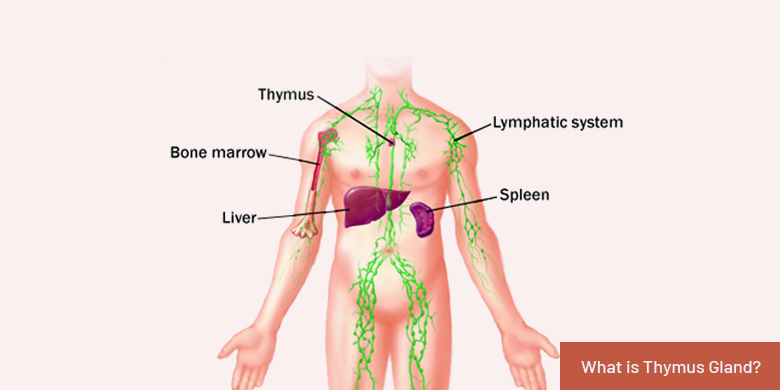 For getting more thymus gland information, keep on reading the rest of the article. 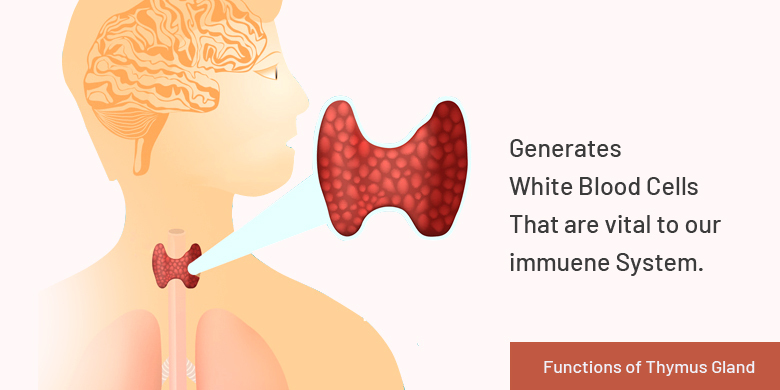 The primary role assigned to the neck sweetbread (an alternative term for the thymus) is to facilitate the functioning of adaptive immune system of your body. A particular type of leukocytes or white blood cells, called T lymphocytes, are educated in this region which are then released into the blood stream and set to attack and neutralize the dangerous substances that get entry into the body. For the accomplishment of the cell - mediated immunity, the T-cells have a specialized region on their surface which enables them recognize and attack a particular peptide antigen and eliminate the risks that may be caused by it. Here you need to differentiate between the functions of B & T cells, where the former are capable of recognizing the free-floating antigens in the body, while the latter cannot recognize them. However, T cells accomplish the tasks of cell - mediated immunity in two different ways, i.e. they may either directly attack the cancerous or infected cells or direct and regulate immune responses in your body. 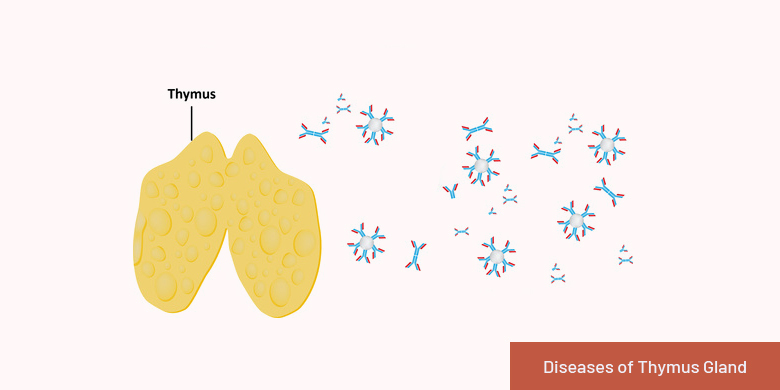 There are two broader categories of immunological disorders related to the thymus gland, viz. immunodeficiency (or autoimmune diseases) and allergy (or hypersensitivity). Some of such ailments of this organ are of mild nature, while the others are associated with severe symptoms that may even lead to the death of the victim. Characterized by excessive or inappropriate immune response to the common antigens in the body, hypersensitivity is triggered by the substances, called allergens. This, otherwise mild disorder, may sometimes be aggravated leading to extreme and fatal symptoms, a medical condition usually termed as anaphylaxis. As the development of defense force of your acquired immune system, viz. T lymphocytes, takes place here, any abnormality or defect in this organ may badly disturb the functioning of the protective mechanism that may even claim an individual's life. The deadly disorder of AIDS (Acquired Immune Deficiency Syndrome) results from the attack of HIV (Human Immunodeficiency Virus) that not only destroys the mature T-cells, but also damages the thymocytes that are being developed in the organ. In most of the cases, the massive destruction of the leukocytes (white blood cells), results in the ultimate death of the victim.